Earlier today UFC held a UFC on ESPN+ 1: Henry vs. Dillashaw pre-fight press conference at Music Hall of Williamsburg in Brooklyn. The event will go down this Saturday night (Jan. 19, 2019) from inside Barclays Center in Brooklyn, N.Y. 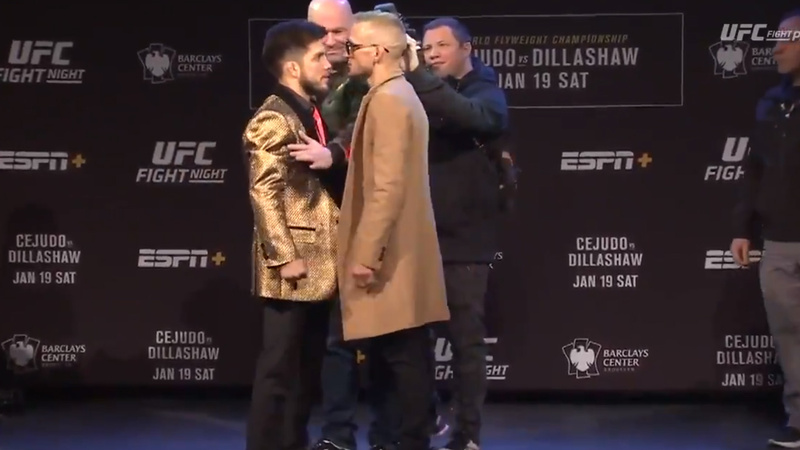 The main header features a flyweight title fight where divisions champion Henry Cejudo, who will defend his gold against current Bantamweight champion, TJ Dillashaw. ‘Viper’ has a chance to become a fourth UFC champion in the history of UFC if he pulls a win this weekend. Also featured on prelims, Donald Cerrone returning to lightweight to collide against up-and-comer Alexander Hernandez who only fought twice inside the Octagon. Check out full fight card here.